Buying a good mattress is an investment into your health and it can pay immediate dividends by allowing you to get a great night’s sleep which will give you a boost of energy throughout the work week. Mattress protectors are the insurance policy that will protect your investment from unforeseen risk. The best mattress protector, just like the best insurance policy, is different for everybody, and depends on what you perceive as your greatest needs and what factors in your life circumstances could present problems down the road. Mattress protectors can vary greatly in price, from around $10 all the way up to $200 and beyond. If you are in a high risk situation, it makes sense that you would spend more on your mattress protector, but if you live by yourself in a clean building, you can definitely get away with a lower end mattress protector. For an in-depth look at some of the best mattress protectors on the market, check out our list of the 10 Best Mattress Protectors Available to Buy Online. The main factors that mattress protectors defend against are liquid, allergens, dust mites, and bed bugs. People who have pets or children are at a higher risk for spills or urine, and should therefore choose a mattress cover that completely covers their mattress on all sides. Some mattress protectors are waterproof on top, preventing a sleeper’s sweat from seeping into the mattress, but are not waterproof on the elastic sides, which could be a problem if a child spills a drink. If spills are a constant concern for your mattress, we recommend looking into the Bear Mattress Protector, which places a premium on defense against liquid and moisture. If you live in a place where there is a high level of particulates in the air, or you suffer from respiratory issues like asthma and bronchitis, or need to manage symptoms of eczema or allergies, you will most certainly be looking for a hypoallergenic mattress protector. We recommend looking into the Luna Hypoallergenic Waterproof Mattress protector, which places a premium on defending your mattress against airborne allergens that can find their way into your mattress. If you live in an old building, or a neighborhood where bed bugs are a known problem, we recommend looking into the Sleep Tite Lab-Certified Mattress Encasement Protector. 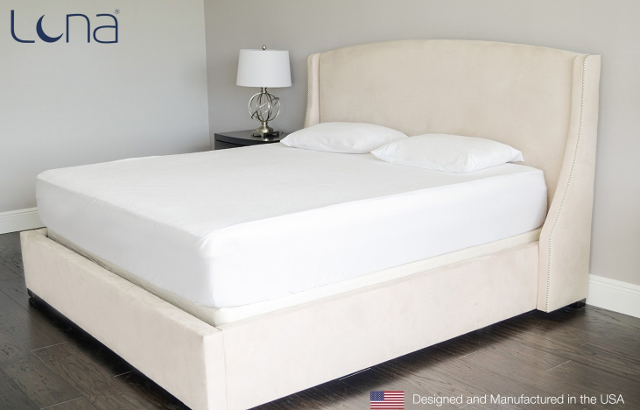 This mattress protector fully encloses your mattress and seals with a zipper, and has been lab-certified to keep bed bugs from making your mattress home. If you are not sure which factor you are at the highest risk for, but want a great all around mattress protector at a great value, check out SafeRest’s Premium Hypoallergenic Waterproof Mattress Protector which is a versatile mattress protector and retails at only $25. On top of the risk factors, there are a few variables that can be downsides for some consumers. Most mattress protectors constrict air passage due to their waterproof membranes, making them hot to sleep on, though some are better than others. The waterproof material can cause some mattress protectors make a plastic crinkle noise while you sleep, which can also be bothersome. Also, some mattress protectors only come in certain sizes, so make sure to buy one that will fit the dimensions of your mattress. The best way to choose a great mattress protector is to take all of your personal variables into account, and then do some research to figure out which mattress protector is best for you.